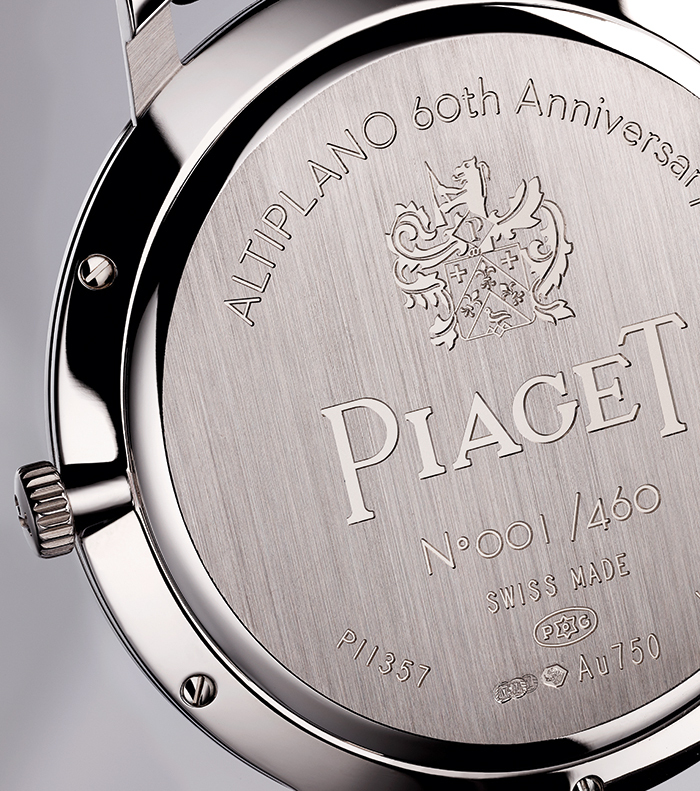 In 1957, Piaget revolutionized the watchmaking world by launching an ultra-thin watch. Its unprecedented thinness awed the people, not only for its slimness, but also for the distinguished appearance and versatility of its design. It was simple yet elegant, luxurious yet flexible enough to be worn casually. This ultra-thin watch immediately earned a notch in watchmaking history. Georges Edouard Piaget started his first workshop on the family farm in La Cote-auc-Fees, a small village in the Swiss part of the Jura back in 1874. He wanted to create high-precision movements to supply existing brands in the region. His backyard business grew quickly and his fame spread even quicker. As his business grew, so did his workshop. And when he died, he passed on his shop to his son. As the years pass, the brand Piaget soon sold watches under its own name and gained international recognition for the brand’s attention to aesthetics and technical performance. In 1957 G.E. Piaget’s descendant revolutionized the watchmaking world by releasing the ultra-thin 9P manual winding movement at the Basel watch fair. The movement measured a mere 2 mm thick. Its elegant design, performance, and reliability was admired by the community. Just three years later, the founder’s grandson astonished the world with the 12P, an ultra-thin self-winding movement measuring just 2.3 mm. This mechanical marvel was made possible by the use of 24K gold for the micro rotor. 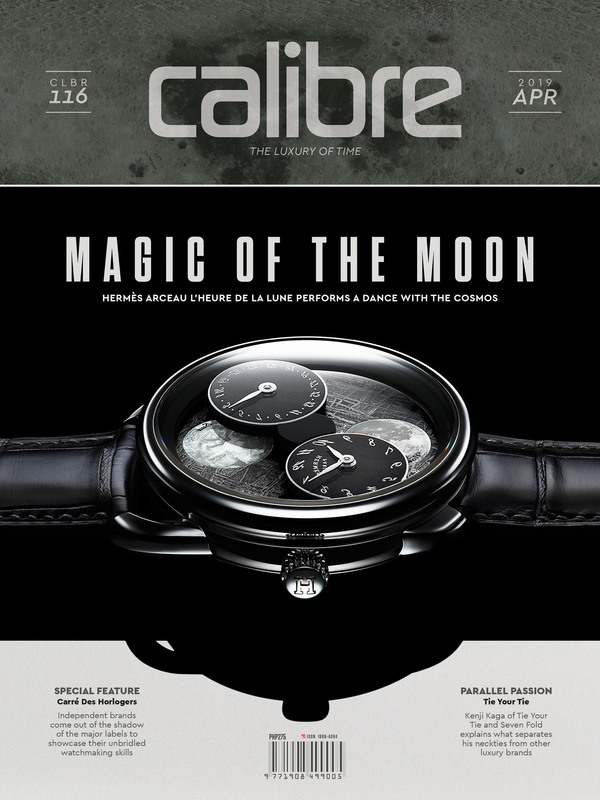 The publication Journal de Geneve said: “Creating a 2.3 mm-thin self-winding calibre had previously seemed a pipedream. The entire research team in La Cote-aux-Fees can take pride in having written one of the finest chapters in watchmaking history, and in having worked in the same spirit that drove the pioneers.” With this breakthrough, the Manufacture decided to dedicate the 12P to its men’s models. The 9P, on the other hand, was made available for both the men’s and the ladies’ watches. With the success of these movements, Piaget focused their endeavors on expanding this line of watches, paying close attention to the relevant designs of the times. Their use of gold and platinum aided in unleashing their creativity for both dials and cases. The balance of design is apparent by their use of slim single and double hour markers with baton-type hands. The refined simplicity of these watches epitomize an ageless design, an understatement that simply explodes with style and grace. 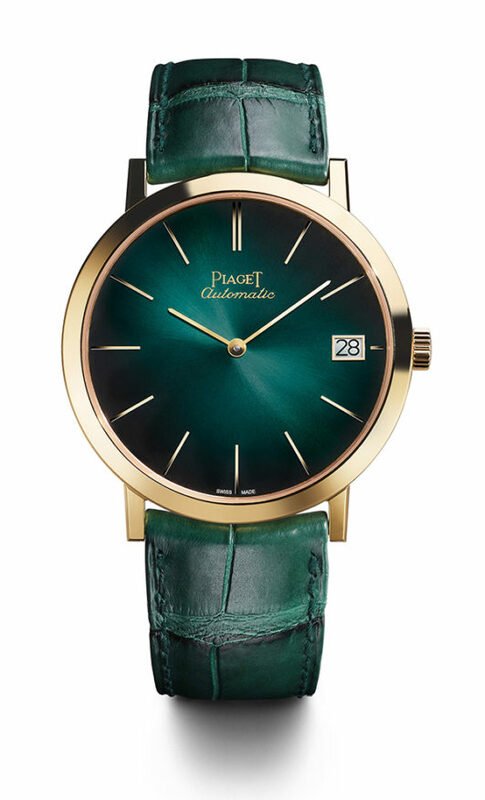 Since its presentation in 1960, the ultra-thin Piaget model evolved over the decades and conformed to the design of the times. When pop culture hit the streets, dials turned colorful with hard ruby, tiger’s eye, lapis lazuli, coral, malachite, onyx, and jade stones. White and yellow case bezels and lugs were dressed with sophisticated “Clous de Paris” hobnail guilloche patterns or set with diamonds. In 2014, to mark Piaget’s 140th anniversary, the Manufacture once again revolutionized the ultra-thin watch by presenting the 900P movement. This timepiece showcased an inverted movement construction by having the bridges and the going train on the dial side. This created a unique and fascinating perspective. 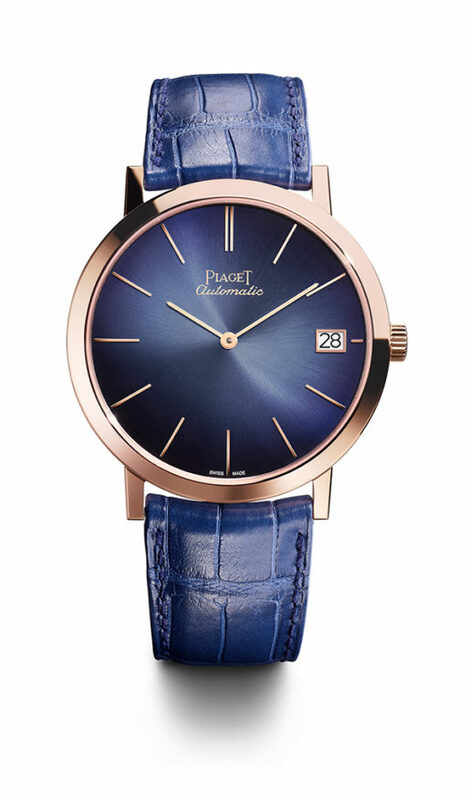 This year marks the 60th anniversary of the first ultra-thin watch by Piaget. To celebrate this milestone, the Maison dedicates 2017 as the year of the Altiplano, the collection from which these ultra-thin watches belong. The anniversary collection opens up whole new horizons inspiring a lifestyle based on elegance and distinction. Sophisticated colors find their place in the anniversary collection. These dials are presented in graded shades that radiate a mood of contemporary elegance. 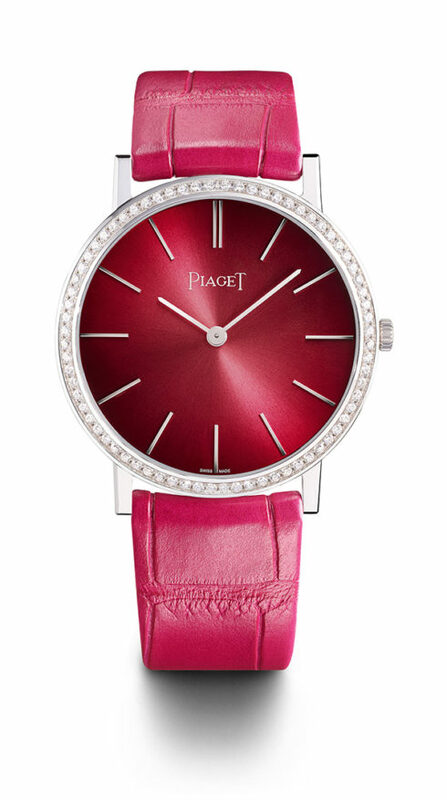 The ladies can appreciate a vivid pink dial that subtly transitions to a softer shade. These 34 mm dials are framed by a case in polished white gold or a diamond-set white gold bezel. These models carry the iconic 9P movement. For the gentlemen, three 40 mm models are available. There is a slate grey dial with a white gold case and hour markers, a midnight blue dial that contrasts beautifully with a pink gold case, and a pine green face matched with a yellow gold case. Each colored dial subtly transitions to a slightly lighter shade of their respective colors. These iterations carry the 1203P, a new movement inspired by the Calibre 1205P presented in 2013 as the natural heir to the iconic 12P. This new self-winding movement carries a date function. The inscription “Piaget Automatique”, which first appeared on the very first ultra-thin timepiece by the Maison, also appears on these watches. Inspired by the first ultra-thin watch in 1957, these two models are offered in a manual winding and a self-winding version. 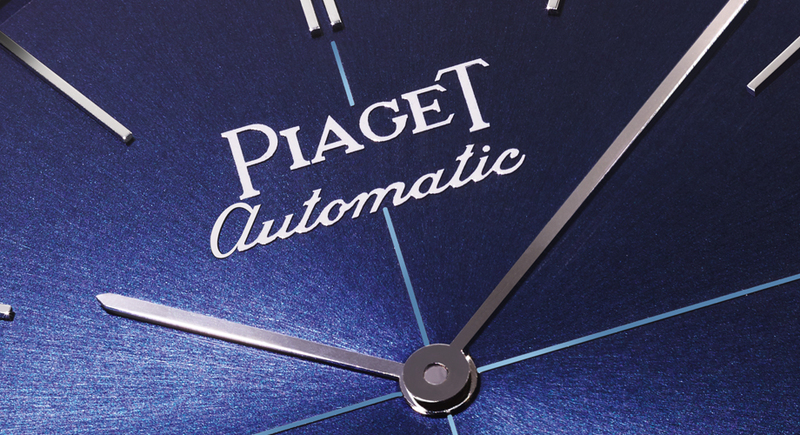 The 43 mm diameter of the self-winding model emphasizes the perfectly balances lines of the Piaget Altiplano. 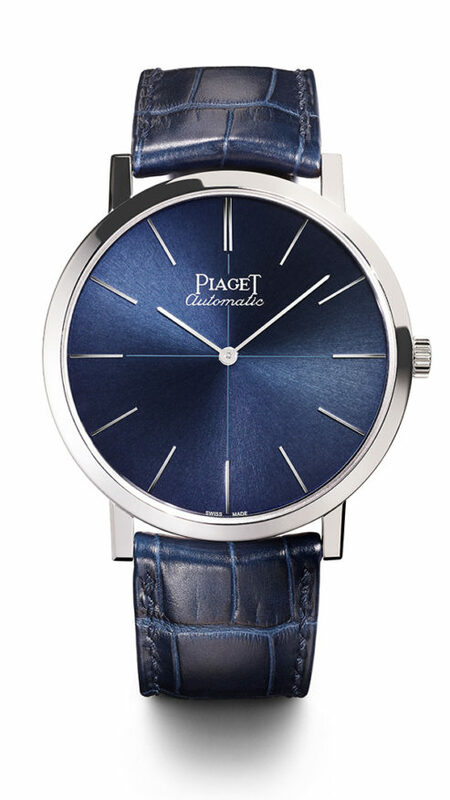 “Piaget Automatique” also appears on this model. The Manufacture equipped this watch with the Calibre 1200P, a movement that measures 2.35 mm thin. This movement was presented in 2010 for the 50th anniversary of the 12P. It symbolically forms a bridge that connects the past and the present. The 18K white gold case has beveled bridges adorned with circular Cotes de Geneve. The main plate has a circular grain pattern with satin-brushed steel parts and blued screws. 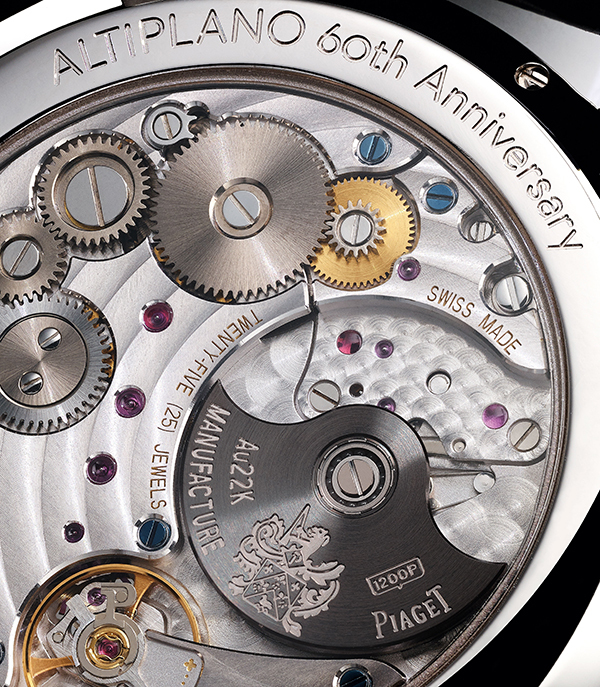 This self-winding version sports a gold oscillating weight engraved with Piaget’s coat-of-arms. 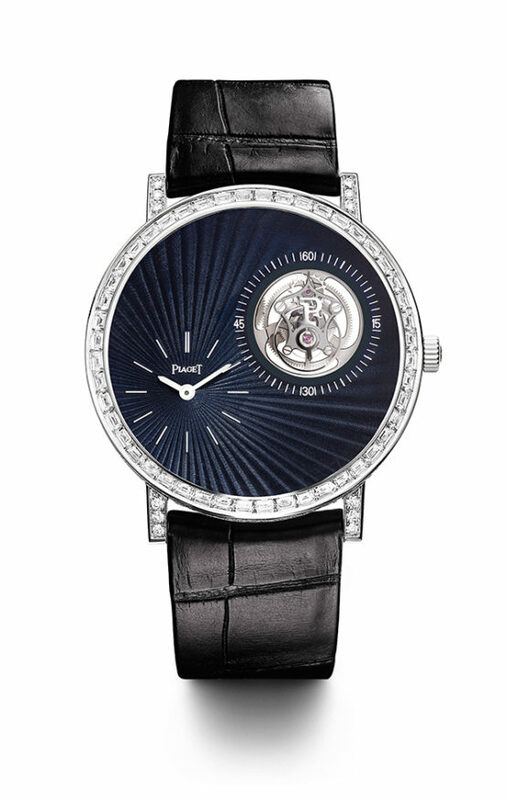 The Piaget Altiplano 38 mm-diameter model carries the manual-winding Calibre 430P (2.1 mm thin). Developed, produced, and decorated by the Manufacture de Haute Horlogerie, this movement has established itself as a worthy heir to the 9P. Like the latter, universally acclaimed in 1957 for the beauty of its profile and its construction, Calibre 430P is renown for its aesthetic appeal and its reliability. Developed, produced, and decorated by the Manufacture de Haute Horlogerie, this movement has established itself as a worthy heir to the 9P. Like the latter, universally acclaimed in 1957 for the beauty of its profile and its construction, Calibre 430P is renown for its aesthetic appeal and its reliability. The 1960s gave Piaget the opportunity to create flamboyant hard stone dials. This opened up doors to design their watches with vivid colors and textures. Rubies, emeralds, coral, and onyx were some of the materials they used for their dials. This year, a natural turquoise dial enlivens the Altiplano collection. It is accentuated by white gold set with 72 brilliant-cut diamonds. A second timepiece is presented in a white opal dial enhanced by a pink gold case, also set with diamonds. These two timepieces carry the Calibre 430P. For the 60th anniversary of the Altiplano, Piaget presents the Altiplano Tourbillon High Jewelry watch. This is the first time in the collection’s history that a model is fit with a tourbillon. Adding a tourbillon to an ultra-thin movement is a very challenging project for any brand to accomplish. 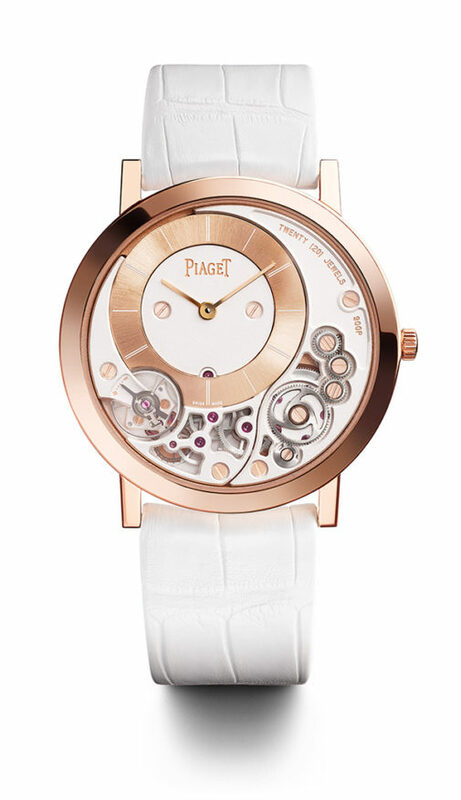 Piaget, with their expertise in the field of really thin movements, did just that. It demonstrates the Manufacturer’s capacity for innovation and creative interpretation of the finest horological complication. The 670P ultra-thin mechanical manual-winding tourbillon movement measures just 4.6 mm thick. It is equipped with a patented stem-winding system featuring an intermediate wheel. It also has a new barrel increasing the power reserve to a comfortable 48 hours. To accentuate the airy beauty of the flying tourbillon, the engineers created a three-bridge titanium carriage that weighs a mere 0.2 grams. The dial is made of gold. It was given a guilloche pattern before delicately coating it with layers of transparent enamel. The dial was subjected to three firing phases to achieve this shiny glaze. It has an asymmetrical arrangement with the time displayed at the 8 o’clock position and the flying tourbillon at the 2 o’clock position. The position of the time and tourbillon discreetly emulates an infinity sign. The case, dial, and buckle are decorated with brilliant-cut baguette diamonds. The case back bears the anniversary collection inscription. These are the watches of the Altiplano anniversary collection. Each of them displays a contemporary distinction that pays homage to an icon that began sixty years ago. The uncluttered and minimalistic design of these timepieces present themselves in a signature aesthetic that is unmistakably Piaget.